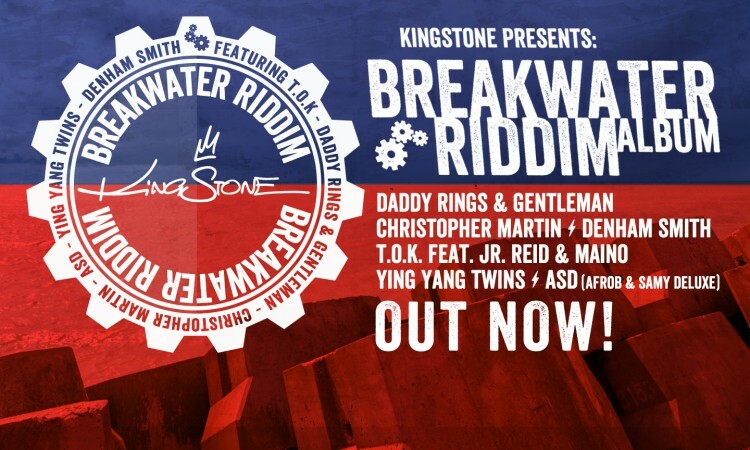 The “Breakwater Riddim” is a formidable riddim compilation on a pumping offbeat with a thrilling horn section and a sweet dancehall flavour featuring tracks from Christopher Martin, Daddy Rings & Gentleman, Denham Smith, T.O.K. with Jr. Reid & Maino, Afrob & Samy Deluxe (aka ASD) and Ying Yang Twins. The track “In The Streets” is an exclusive collaboration between Daddy Rings and his musical brother Gentleman. The lyrics precisely reveal the current status of the worldwide crisis and its wars and terror. The video of “In The Streets” nearly has 200,000 views on Youtube. But kicking off this EP and injecting the right vibe is Jamaica’s big deal and the ladies most haunted Christopher Martin and his song “Sugar Reggae”. Denham Smith warns everyone who stands in his way – what a rude boy anthem! T.O.K. featuring Jr. Reid & Maino salute all fallen soldiers and show us how Jamaicans traditionally bury their decedents in a funerary procedure called “Nine-Nights or “Dead Yard”. The video of this song is very special because it is the first animated video of T.O.K., Jr.Reid and Maino in combination. The notorious Ying Yang Twins from Atlanta want to get high; they have it all but they are in desperate need of a lighter. Germany’s top-a-top Hip-Hop duo ASD focuses on socially critical issues and finally you can find the Breakwater riddim instrumental made by hit-producer Bazzazian, who layed numerous beats and riddims for artists like Gentleman, Haftbefehl, ASD, Samy Deluxe, Booba, Sefyu and many others.